Bumper Bracket Mounting Kit - Front & Rear 24 pc. 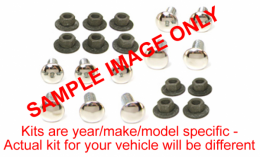 Front & rear bumper bracket mounting kit- 24 pc. Mounts bumper brackets to frame. Pieces come bagged and labeled for an easy install. This kit fits the models listed - may fit additional years / models. Top quality, USA made.